Where to Start? Married life has been great so far. Can't wait to see what 20 years brings us, anyways, enough with the mushy stuff. I had initially given myself 2 years to get ready to go public with my art but after hundreds of hours listening to audio books, studying the human anatomy, and sooo many sketch books. I think I am ready to show the world that I am an artist. I can now confidently draw my thoughts on paper. 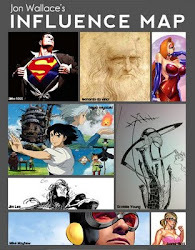 Thanks to Leonardo Da vinci's notebooks and Alex Rosse's amazing comics to inspire me. Without my wife I wouldn't be here so fast at all. Now im still studying, the pursuit of knowledge never ends but I will now be taking commissions. Speaking of Commissions I have been asked to draw an 11x17 Shera vs. Superman. that I'm really looking forward to. I am open for Commissions, and my prices I believe are pretty reasonable. Please allow 1 week for completion and the shipping fee is in the costs of the overall project. Here are the prices. These are the prices for licensed( superheroes, cartoons etc ) characters. For Concept Art that you have full rights to - 75.00 b/w only. p.s. here are some drawings from over the weekend.